I was invited by the marketing & direct sales manager, John, of Novotel Clarke Quay recently to try out their new and improved international buffet spread at the The Square, their restaurant in the hotel. I was so stoked because I love a good buffet, and it's been a while since I've had any! 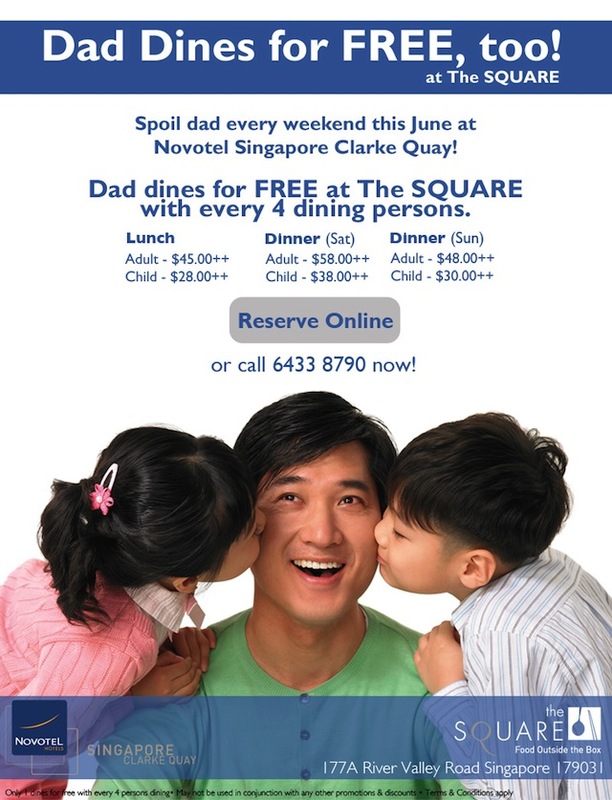 Novotel is situated just beside Liang Court, which can be accessed by train from Clarke Quay MRT, or several buses. It was a tad longer to walk from the station though and we were suitably hungry by the time me and my friend Wing reached! At the restaurant, we met up with John, who gave us a tour of the buffet line-up and also introduced to us the current theme for The Square - Big Feature Dishes! I'll show you what that is in a bit. We also met Jean-Philippe (guy in photo), the French chef at helm of the restaurant who was from Bali previously. He was the one who conceptualized this theme, and also created interesting fusion food. The place itself was very pleasant, as it was not too noisy or chaotic like some other buffets. So here goes the line up! I took so many pictures but it's impossible to show all, so I'll just do a selection, from starters, mains to dessert. They have a selection of fresh seafood to start with, including some standard sushi items. It is not a very wide selection when you compared to The Line for example, but each buffet place has their own specialities. Fresh oysters! I did not take any though, not really a big fan. They also have a range of refreshing salads. I like this one the best! After the salads they also have 2 types of soup available - pumpkin and ABC soup. I took a small bowl of the pumpkin soup which unfortunately was quite watery so I suggest you try the other one! And now, here's one of the Big Feature Dish! A gigantic parma ham. The staff will slice up thin slices for you, but look at that! You also see in the background a GIANT sausage. Again, another feature. Isn't it cool? This is the giant mortadella sausage. They also have some meat dishes, like seabass and roast lamb. Had some roast lamb which was very tasty, especially with the sauce. 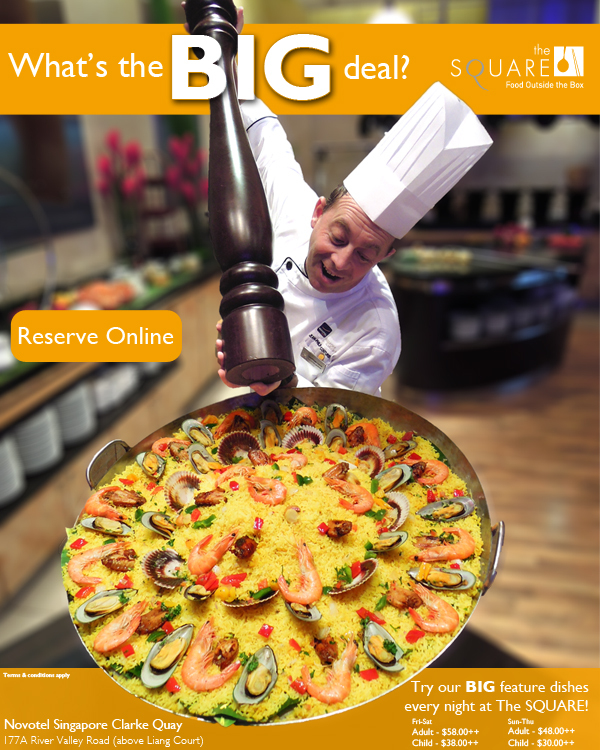 Here's another giant dish - the Paella! It is featured in the poster as well. Here you have a 1 metre grilled snail sausage - interesting taste, it was salty and dry but had some spices inside. They also have a hot food section, where the staff will help whip up a local laksa or noodle dish for you! The staff there were all very helpful and friendly. They also had a 38kg parmesan cheese wheel. This is so insane haha. But they cook the risotto inside! There is also a giant Brie cheese at the bread/cheese section. Here's a giant cake. Very marie antoinette don't you think? Their dessert section is quite comprehensive! All finger food sized. My favorite is the giant chocolate sauce fondue with fresh fruits. Here's a selection of desserts I took. By then we were suitably stuffed! Lastly, I am going to talk about their ala carte dishes! We were served with the cheese risotto with parma ham first. I loved it! It was cooked in a pan and then rolled in a parmesan wheel so that the heat melts some of the cheese and the rice gets coated. The cheesy taste was just right, and not too salty. Next we had another awesome dish - the cod fish with tiger prawns in laksa bisque. It was my favorite dish of the night. The codfish was cooked to perfection and draped in the thick gravy which is oh so addictive! It is also served with chicken rice, so imagine - this is Singapore on a plate! I had a great time sampling the food from The Square! It's a great place for gatherings and dinners. In fact we saw a table of people celebrating a birthday. There is a Birthday Package where the birthday celebrant dines for free with every 10 dining adults and gets a birthday cake. And for the entire month of June there is a Father's Day Promo! 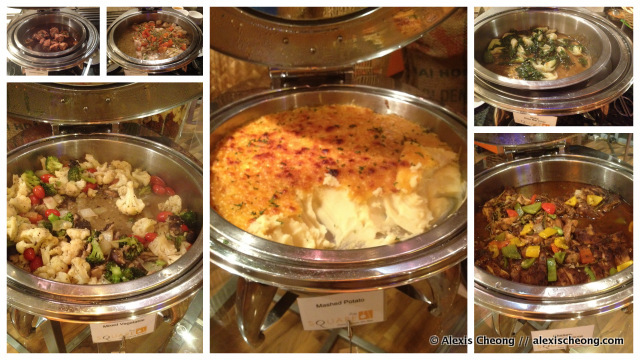 This is an invited food review by Novotel Clarke Quay. Thank you for sharing the post. I am looking forward to visit the place this week.